Designing a pool for your backyard can be an exciting yet daunting experience. There are so many angles to think through and various factors to consider when you are thinking of totally transforming your property. Sometimes it is hard to envision exactly what you have in mind and how you want the final product to look. That is where we come into the picture! 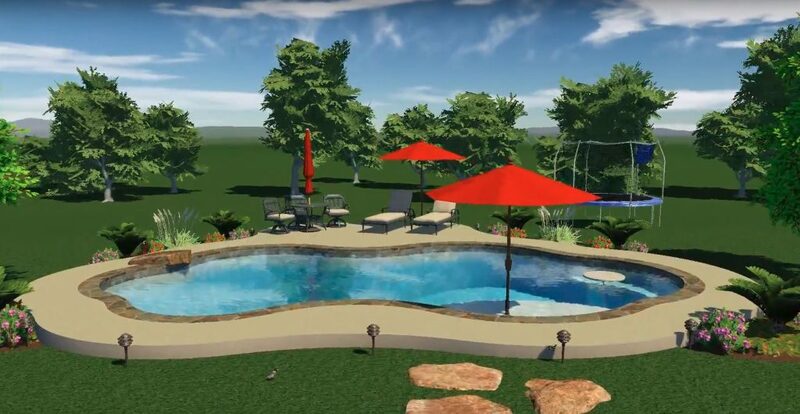 Our 3D Designs for your backyard oasis will vividly bring your dream into a reality. Our step-by- step design process is easy to understand and built with the customer in mind, from the initial design that may have been scratched out on random scrap paper to the final professionally animated product. We will take all of your hard work and planning and incorporate it into a workable design that will leave you with a breathtaking product! For each new project that we take on, we have the same end goal as the client: to create an amazing and beautiful outdoor space at an affordable cost. We know that you want to achieve a feeling of complete rest and relaxation while enjoying your new pool, and we settle for nothing less than perfection as we work to achieve this goal. Here, we have laid out exactly what the design process will look like for you as we move from the initial survey of your property into the technical details of a 3D visual. The Varsity sales and design team will visit you at your home to identify what you and your family are looking for in a pool environment. Every pool that we build at Varsity is a custom built pool, designed to exceed each customer’s specific needs. During our initial visit, we will take measurements of your backyard and obtain a copy of your home survey. This allows us to begin designing your backyard paradise in 2D, and we will be able to better understand your vision once we have looked at the property together. Our design team will then begin mapping out your pool with state of the art software. This software will enable us to design the exact pool that you and your family envision. This 3D rendering that follows will allow you and your family to adjust, tweak, or change your custom designed pool in any form or fashion. We enjoy a good challenge, so, basically, If you can dream it, we can build it! Once the Varsity design team has concluded their design work on your concept, you will be provided with your own 3D animation. This will include, among many things, a 360-degree view of your new pool for the entire family to review and conceptualize. For many of our clients, they do not fully grasp the project as a whole until they sit down and watch this final 3D product. This final step brings a very strong sense of reality to something that has only been a dream for many years! Please view our gallery with virtual tours so you can see the variety of pool designs we offer.